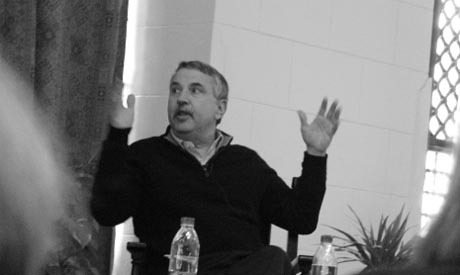 Prominent American author Thomas Friedman spoke at the American University of Cairo (AUC) on Monday, where he expressed his views on Islamist political ascendancy in the wake of Egypt’s first post-Mubarak parliamentary polls. Friedman also stressed the importance of opening dialogue with Egypt’s Islamist political forces, asserting that Washington should abandon its longstanding strategy of allying itself with single heads of state and begin allying with the people. Friedman, who was a vocal proponent of the US-led invasion and occupation of Iraq, also stated his belief that Egypt’s Islamists would eventually see a clash between their core principles and modernity. Unlike Saudi Arabia and Iran, he said, Egypt lacks the oil revenue to ease the inevitable collision. Following Egypt’s parliamentary elections, which are set to conclude on 11 January, the Muslim Brotherhood’s Freedom and Justice Party is poised to become a leading force in Egypt’s post-Mubarak political landscape. Friedman went on to draw a comparison between the Egyptian and Indonesian models. In the latter case, Islamist parties swept democratically held elections in the 1990s, but soon lost ground after failing to meet voter’s expectations. Responding to a question posed by Ahram Online on the future of Egypt’s free-market economy under an Islamist-led government, the three-time Pulitzer Prize winner said that Islamists would eventually be forced to adapt to “modernity.” He pointed out that the relatively lenient positions adopted by Islamist parties on certain controversial issues – like the regulations governing Egypt’s tourism industry – represented a clear indication of this trend. Friedman added that the independence of Islamic religious authorities, such as Egypt’s prestigious Al-Azhar – long marginalised due to its close association with the state – could play a role bridging the gap between Islamic tradition and the modern world. The writer went on to blast certain elements of the US political system, especially the inflated role played by big business in US policymaking and legislation. “It’s fascinating how the revolution empowered people in [Egypt],” he said, going on to warn of the possible effects of institutionalised corruption on Egypt's newfound democracy. “Our congress [in the US] has been a forum for legalised bribery,” he said, going on to warn that, “Money will kill your democracy like it did ours.” He added: "Keep your eye on the money." "Our protest isn’t just against Friedman – it’s against the policies of our university, which were closely associated with the former regime,” said Roqaya Tbeileh, president of the university’s Quds Club, who took part in a small protest against Friedman’s visit. “And now they bring a supporter of war crimes,” she added in reference to the controversial writer. El-Korma’s assertions were met with applause by the audience but failed to draw a response from Friedman, who replied to another student critic earlier by saying that, "In the Middle East everybody wants to own you, and if they can't, they will try to destroy you." Brothers & Sisters have done the time, in the trenches, servicing the peoples. Change arrives.